Understanding that sustainability is no longer a niche but a norm of today is crucial in every industry, especially in forestry. Forest carbon stock regulation through sustainable woodland management is identified as a significant feat to combat climate change, which is why Theo’s Timber adopts and opts environment-conscious options in the overall timber resources procurement. By definition, forest carbon stock is the amount of carbon stored in the forest ecosystem that are sequestered from the atmosphere. Statistics shows that the UK woodland stores an increasing amount of carbon stock from 1990 to 2015, however, the net annual rate of the carbon dioxide accumulation by the UK forests is expected to decrease from 21 million tonnes in 2020 to 19 million tonnes by the end of 2030. Further, this can be regulated through responsible forest management and by planting more trees as the Kyoto protocol showed that the UK managed to meet its carbon emission target since 1990 to 2015 through the aid of newly-planted woodland. The UK has 13% of its total land area covered by forests, which is an estimated 3.17 million hectares of timberland, housing approximately 3,814 trees. Nevertheless, from the total forest area, only 1.38 million hectares (43%) are certified independently as sustainably managed, to which the government targets an additional 37% increase in the succeeding years. Every year, the UK utilises 50 million cubic meters of timber, where 10.6 million cubic meters are homegrown and 95% of these are softwood/conifers. 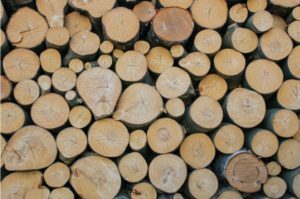 Moreover, wood has over 5,000 known uses and an average person in the UK is estimated to use at least 12 trees per year in their everyday life, i.e, for clothes, paper, construction materials, and many more. By 2050, demand is tripled and Britain is expected to supply less than 22% of the total timber demand across the UK and majority of the country’s timber merchants are becoming widely concerned about the future of hardwood resources as the demand exponentially increases. Additionally, many British timber merchants and consumers fail to treat responsible sourcing as a key issue despite expressing long-term business interest in such propositions. For this reason, Theo’s Timber shares a vision with the Forest Stewardship Council (FSC) to commit to promoting responsible regulation of woodlands by opting for ethical and conscious management of UK forests that benefit the industry and the environment.